To kick off the start of summer, I said yes to Patrick Joson’s invite for a Fondo Manila recon ride last Saturday. It was to be my first bike ride outside of the secure village we’ve been training in the past weeks. The only other time I ever rode out in the open was at Subic during last year’s Next Step Tri Camp. Never again until last Saturday. 1) Don’t look stupid. You’ll never know who’s watching. It was my first bike out in cleats. I thought we were going to be three or four in the group, but when I showed up at Starbucks Alabang, we numbered around 30. 30! And they all looked like pros. Crap! A lot of people won’t believe me when I say this, but it’s the truth: I’m anti-social. I’m a solo flight kinda girl. Don’t get me wrong. I like you! I like meeting people! But, most of the time, I enjoy my independence, the solitude, and my time alone. I learned from Pat that day that, to keep safe from vehicles, cyclists always ride as one, like a school of fish or a flock of birds. And, if you’re lagging behind—which, in this case, I was—then you must always try your best to catch up. Pedal away even if you’re tired, or out of breath, or dying of thirst because you still can’t let go of the handle bars to grab your bottle. 3) Biker dudes…or cycling dudes…or cyclists…whatever you call ’em are a friendly bunch. Most of the time, I kept to myself. Riding alone on the road even when the others biked in pairs. But, every now and then, a friendly biker would pass by and exchange a few words of encouragement or friendly chit chat. My next goal is to be able to chat while occasionally looking at the person I’m chatting with. Methinks it was quite impolite for me to talk to them with my eyes directed straight towards the road the entire time. 4) Saddle f&#@!! sores are a major bummer. I wouldn’t wish this upon my worst enemy. Okay, maybe I would since it’s just extreme pain in one day that goes away the next. I have never screamed so many curse words in my head in such a short period of time. As we were climbing up the road (I think towards Amadeo. I have no clue really because I was going insane by this time), I could not think of anything else but the pain down there. Saddle sores are a soft word for such awful, excruciating, hellish pain. I would rename it to: saddle f&#@!! sores. I used thick-padded bike shorts. I used petroleum jelly and a bit of Hammer Seat Saver. But oh noooo, nothing was enough to prevent saddle sores that day. Friends said I just need more saddle time. If that’s what it takes to drive this problem away, then let’s do it. Despite throwing in the towel at 30k to prevent brain hemorrhage from the pain of saddle sores, I enjoyed myself that day. I checked the time as I was headed home: 8 am. I spent two hours out on the road. My mind instantly thought: I should’ve used those 2 hours for a 21k run instead… But, I caught myself and realized that it was all in great fun. Looking forward to my next bike ride…hopefully with a new saddle! Thank you to Peter Capocao and Patrick Joson for the photos. 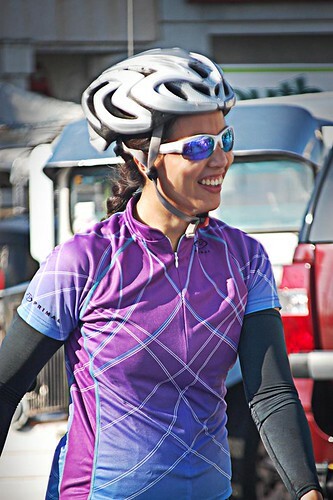 This cycling event, the Tour of Hope, has found its way to this running blog because 1) I support the fight against cervical cancer, 2) some of these cyclists are runners, and lastly, 3) my big sister requested me to promote it; she is the event organizer. I initially wanted to join this until I realized that it coincided with TNF at Clark and…uhm…I haven’t biked that far in my entire life. Maybe next year. At least I can help by making a pledge. You can too! Cervical cancer is the second most common cancer in women worldwide, with 500,000 new cases and 250,000 deaths reported each year. Over 80% of cases occur in developing countries including the Philippines, where it is ranked as the second most common cancer afflicting Filipino women. 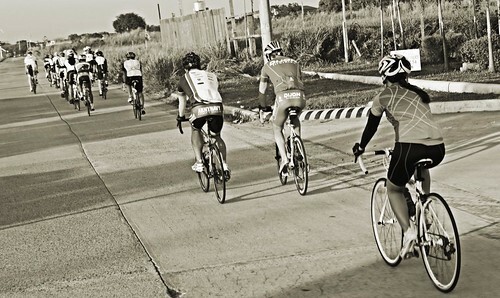 The Tour of Hope is a cycling event that is held all over the world and is now on its second year in the Philippines. 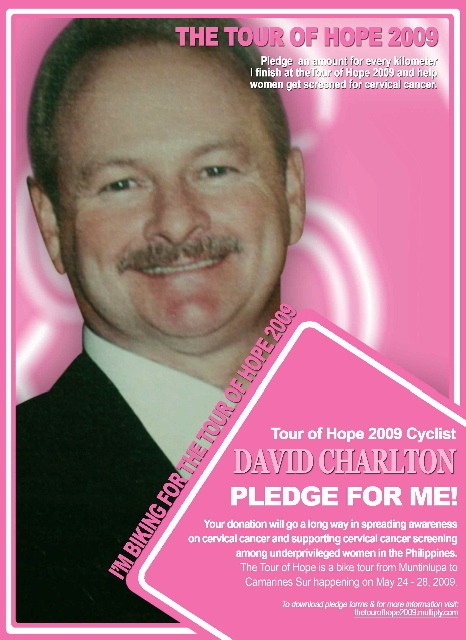 This year’s tour will cover approximately 500 kilometers spreading the cervical cancer advocacy through out Southern Luzon, kicking off at Muntinlupa on May 24, 2009 and ends in Camarines Sur on May 28, 2009. The event is a joint project of Bravehearts, CECAP, CIF (Cancer Inst. Foundation Inc) supported by GlaxoSmithKline Philippines, Campaigns PR Inc., Team David’s Salon, Gold’s Gym, Crocs, Maldita,, Gatorade, Wings Photography Inc., Personifi, Philam Life Insurance, Destiny Cable, Metro Magazine, Action and Fitness Magazine, Health Today, Manila Bulletin, Business World, Mabolo Flowers, Nikon, and Creative Juice. For more information and for details about how to pledge or how to join the bike tour, call 7138144.